This may be the most indifferent camera review I have ever written because, after using it...I'm not quite sure how I feel about the Canon A-1. I wasn't looking for another Canon FD body when this one streamed into my Facebook feed, although I do have to admit that the A-1 was always sort of in my peripheral vision. Some photographers I follow on Flickr do some nice work with their A-1s. And I've stumbled across a couple of YouTube videos with new-to-film photographers gushing praise on this Canon. So for the $60 asking price and the assurance from the almost local seller that this camera was operating as designed, I went for it. 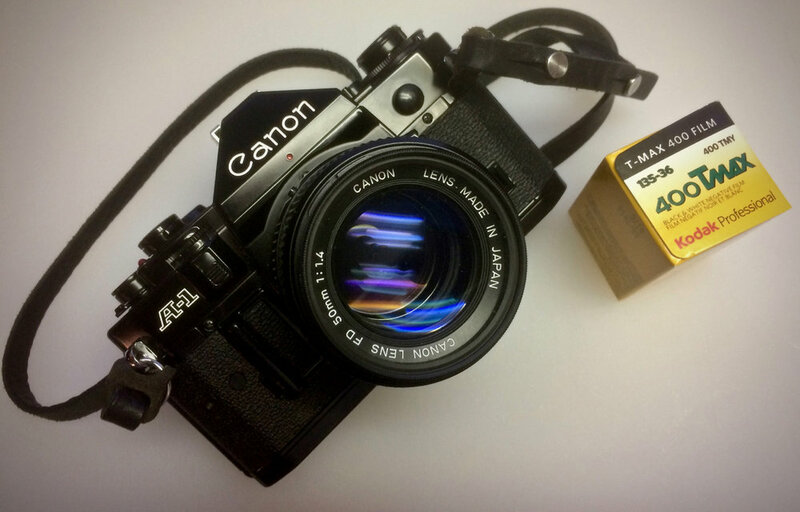 The A-1 was introduced in the late 1970s as one of Canon's A series of cameras, which included the AE-1 which was and still is more popular. The A-1 was the top of the line in the series and from what I can tell, was built more robustly than the other A cameras. The A-1 sits right at that sweet spot in camera design and build where just bits and pieces of plastic were being used on an otherwise all metal chassis. It wouldn't be long before Canon would introduce the EOS line and the industry would embrace plastic construction and blob-like camera bodies. The A-1 is also a historically significant camera in that it offered every available metering mode plus full automation accessed through a multi-function dial on the top of the camera. 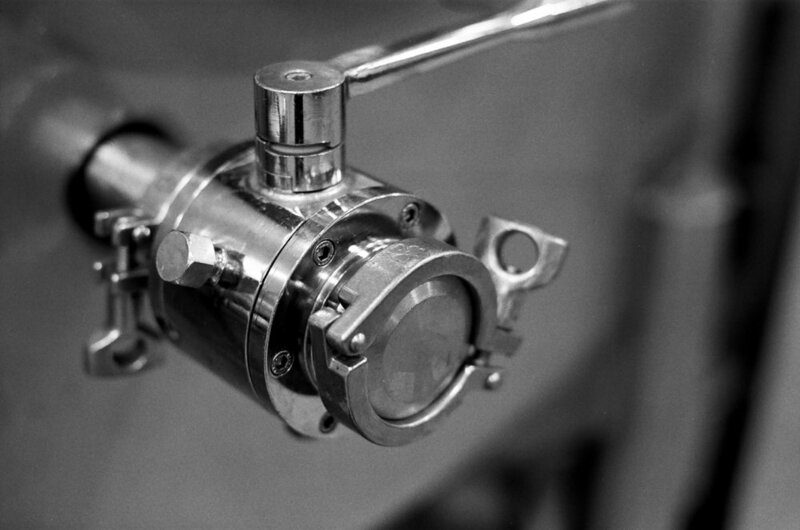 This control, revolutionary at the time, would become commonplace on future film and digital bodies. And it's this dial that makes this camera, at least for me, just "eh" rather than "yeah!" I'm more comfortable shooting either manually or in aperture-priority mode, so I headed out to a local winery for some indoor shots in their cellar with the A-1 set in Av (aperture-value) mode. 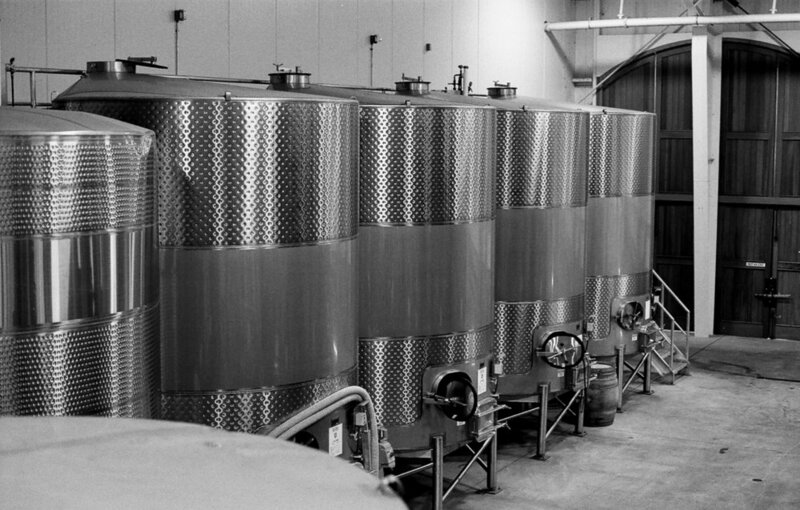 The camera was loaded with Tmax 400 and it was my intention to capture some features of the wine crushing equipment and fermentation tanks under available light. 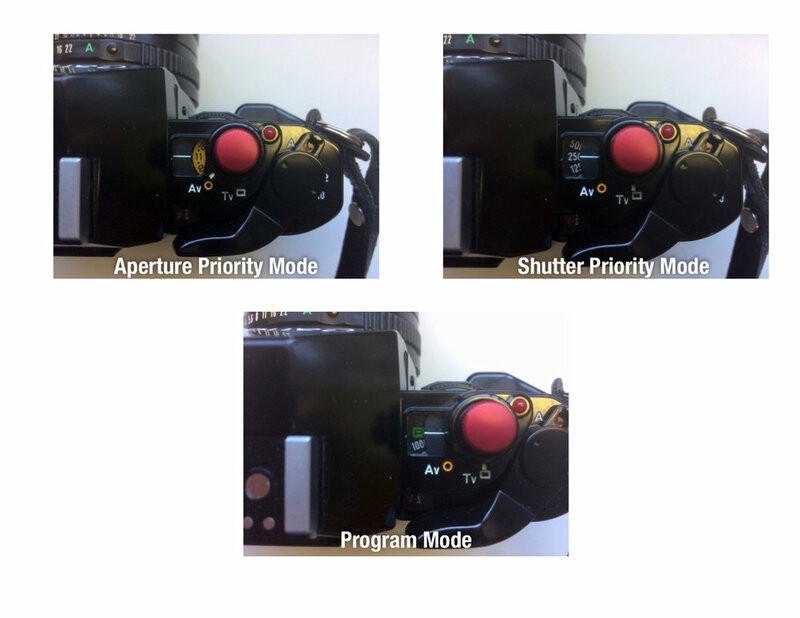 With the A-1 in aperture priority mode, the Canon FD lens is set to "A" on the aperture ring, transferring control to the multi-function dial. The meter in the camera only wakes up when you slightly depress the shutter button and since you're using the same finger to depress the button and spin the multi-function dial, I found this process a bit frustrating and much more time consuming than cameras where you simply adjust aperture on the lens while applying pressure to the shutter release and watch the meter's readout in the viewfinder. I guess Canon intends that you decide on an aperture you want to shoot at, then raise the camera to your eye and let the camera come up with whatever shutter speed is best. If it can't come up with a suitable speed to match your desired aperture, or if you are skilled enough to not like what you see in the digital readout in the viewfinder, than you have to take the camera away from your eye and select a new aperture setting. After fumbling around with this a few times and with only limited time allowed "backstage" at the winery, I shifted the A-1 into fully automatic PROGRAM mode. Once I let the A-1 do all of the heavy lifting, this SLR was a pleasant shooter. The viewfinder is big and bright with a nice split image focusing screen. Shutter speed and aperture are displayed digitally in large red LEDs along the bottom of the finder. Not having to think much about exposure did allow more time to search for interesting subject matter. The A-1 performed well in the fully automated mode, although the camera's computer consistently selected slower shutter speeds over opening up the lens more in low light situations. Many of the images here were shot at 1/30th of a second at f/3.5 and I was worried that I'd have some blurred photos. I guess I am steadier than I thought. So, a few weeks after shooting this camera and now reviewing the images I made, I'm still sitting squarely on the fence. I'm liking these Canon FD lenses a lot, but think I prefer shooting the F-1 body with its AE finder in aperture-priority mode over PROGRAM mode in the A-1. But...it was kinda nice letting the A-1 do all the thinking, freeing me up to concentrate on composition. On the fence. Six of one, half dozen of another. The joys of photography.